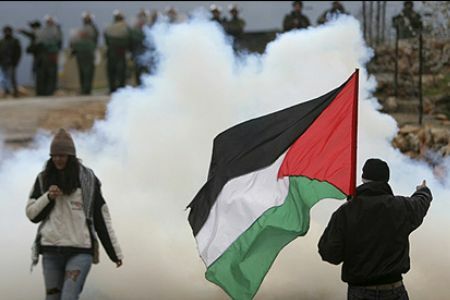 Local and international protesters were tear gassed today as they marched in the West Bank village of Nabi Saleh. Unlike other recent protests in the village, Israeli soldiers did not meet the protesters in the village but along a road leading out of the town. After the march Israeli soldiers entered the village and threw a tear gas canister into a house where protesters had gathered. As protesters escaped the house, more tear gas was shot into the streets. In recent weeks Israeli soldiers have stepped-up their efforts in Nabi Saleh, declaring the village a closed military zone and stopping activists and journalists before even reaching the village. In Bil’in village, also in central West Bank, dozens of Palestinian villagers in addition to Israeli and International peace activists marched after the Friday prayers from the mosque to the lands confiscated by Israel to build the wall. A tractor carrying chairs and trash cans drove in front of the marchers who were heading to Abu Laimun’s family land in order to turn it into a public park for the village. However troops showered them to tear gas and rubber coated steel bullets in addition to an unknown foul-smelling chemical material. Dozens suffered from tear-gas inhalation and were treated by field medics. This week, people in Bil’in marched in support of the Palestinian statehood bid at the UN in September. Troops used tear gas and rubber coated steel bullets also to suppress the anti wall protest in the nearby village of Nil’in. Villagers were joined by Israeli and international supporters after the midday prayers and marched up to the wall. Troops fired tear gas at protesters causing many to suffer from tear gas inhalation. In southern West Bank, many people were treated for the effects of tear gas inhalation as troops attacked the anti-wall protest organized in al-Ma’sara village near Bethlehem. Soldiers attacked protesters as they tried to reach land owned by local farmers that had been taken by Israel for the wall.